PSG welcome Real Madrid for the second leg at Parc des Princes on Tuesday night, looking to overcome a 3-1 deficit from the first leg. Who will advance to the next round? 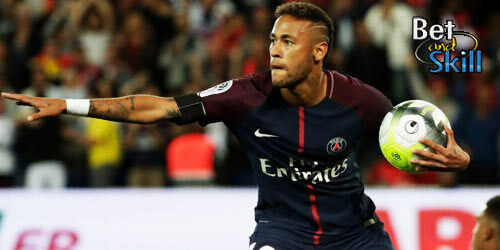 Find here our Paris St. Germain vs Real Madrid betting preview with predictions, betting tips, probable lineups, team news, best odds, bookie offers and no deposit bonuses on all the UCL matches! PSG unsurprisingly sit top of the Ligue 1 table with a 14 point gap over AS Monaco and their home record comprises of 14 straight league wins with 54 goals scored and 9 conceded.. They were defeated by a 3-1 score-line in the reverse leg at Bernabeu, conceding two goals in the last 7 minutes of the match. Since the first leg meeting PSG have won Ligue 1 fixtures at home to Strasbourg (5-2), Marseille (3-0) and most recently 2-0 at Troyes. Unay Emery's men boast a strong home record in Europe - they are unbeaten in their last 12 Champions League matches in Paris and scored 15 goals in 3 home games in the group stage this season including a 3-0 win over Bayern Munich. Star player Neymar is out for at least two months while Kylian Mbappe can recover from an ankle injury in time to play on Tuesday. Neymar's injury should present Ángel Di Maria with an opportunity to prove a point against his former club, as the Argentine is expected to lead the line alongside Kylian Mbappé and Edinson Cavani. Thiago Silva is expected to make a return to the lineup after missing the first leg. Marquinho is also a doubt with a thigh problem but Dani Alves is expected to make a return. In midfield, Marco Verratti will be the playmaker, wit Adrien Rabiot and Lo Celso on his flanks. Timothy Weah, the son of Liberia president and ex-PSG and AC Milan striker George Weah, could play at some stage. After a 1-0 defeat at Espanyol, Real Madrid returned to winning wins with a 3-1 victory at home to Getafe at the weekend, to remain in third place in La Liga behind Barcelona and Atletico Madrid. This result makes it six wins from their last seven games, with them scoring an impressive 23 goals in that period. In the group stage matches in Champions League, the Blancos won both at Dortmund (3-1) and Apoel (6-0) either side of a 3-1 defeat at Tottenham. The defense remains a concern as Zinedine Zidane's men have kept only a clean sheet in the last 11 games in all competitions. Zinedine Zidane has had to do without Toni Kroos and Luka Modric in recent weeks, and while both men returned to training on Sunday, this game will surely come too soon for either to start. Mateo Kovacic should start alongside Casemiro and Isco in the middle of the park.Marcelo also returned to training with the first-team but Theo Hernandez is expected to get the nod as left-back. Gareth Bale played in the last fixture against Getafe and is fit enough to lead the line alongside Karim Benzema and Cristiano Ronaldo. Jetbull offer 9/1 Paris Saint Germain to beat Real Madrid! Our team always strive to select the best odds on every match we preview. Read below the best odds on the PSG vs Real Madrid match winner market (90 minutes only)! We also suggest you to take a loot at our price boosts section and see which are the online bookmakers offering enhanced bets on the upcoming matches. The following section contains our free betting tips on Paris Saint-Germain vs Real Madrid, selected by our expert tipsters. Feel free to copy our predictions and back them on the recommended bookmakers! Please, come back to post a comment at the bottom of this page should you make profits courtesy our predictions! Looking for more free picks on this year's Champions League? Visit our Champions League free tips section! "PSG vs Real Madrid predictions, betting tips, lineups and free bets (Champions League - 2nd leg - 6.3.2018)"